In 1959, Delia Derbyshire applied to become a recording engineer for Decca Records, but was denied due to her being a woman. After a brief stint at the U.N. in Geneva, she took a job as a trainee studio manager at the BBC. In 1962 she became an attachment to the BBC Radiophonic Workshop in Maida Vale where she worked until 1973, creating fantastic, never-before heard sounds for various BBC radio and television programs. She is best known for her arrangement of Ron Grainer's title theme from Doctor Who, which she created by recording the individual notes onto bits of tape and then assembling the song by hand. On hearing the finished piece, Grainer asked: "Did I really write this?" "Most of it," Delia replied. Yet despite Grainer's best efforts, Derbyshire never received any royalties or credit for her performance from the BBC. 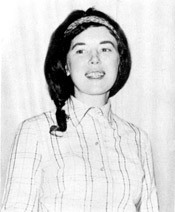 In 1966 she formed the group Unit Delta Plus with Brian Hodgson and Peter Zinovieff. Though the group existed only for a year, they staged some of the earliest concerts consisting entirely of electronic and tape music. Famously, the group performed at the Million Volt Light and Sound Rave in 1967 at the Chalk Farm roadhouse in London, a four-day electronic music event which featured Paul McCartney's sound collage Carnival of Light (now lost in a vault somewhere). In 1968 David Vorhaus enlisted Derbyshire and Brian Hodgson (also at the Radiophonic Workshop) for his psychedelic electronic music project White Noise, releasing the seminal album An Electric Storm in 1969. Among her outstanding television work, one of her favourites was composed for a documentary for The World About Us on the Tuareg people of the Sahara desert. It still haunts me. She used her own voice for the sound of the hooves, cut up into an obbligato rhythm, and she added a thin, high electronic sound using virtually all the filters and oscillators in the workshop. "My most beautiful sound at the time was a tatty green BBC lampshade," she recalled. "It was the wrong colour, but it had a beautiful ringing sound to it. I hit the lampshade, recorded that, faded it up into the ringing part without the percussive start. "I analysed the sound into all of its partials and frequencies, and took the 12 strongest, and reconstructed the sound on the workshop's famous 12 oscillators to give a whooshing sound. So the camels rode off into the sunset with my voice in their hooves and a green lampshade on their backs."